Mobile Suit Action Figure GUNDAM SEED REMASTER 1/144 High Grade (HG) Plastic Model Kits. Plastic model action figure kits that support the mobile Suit Gundam SEED HD remaster anime episodes on Hulu and other Streaming web sites. 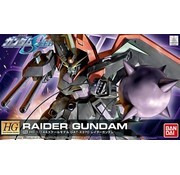 This is a BANDAI Gundam 739193 High Grade 1/144 GUNDAM SEED R-10 GAT-X370 Raider Remaster Ver. Action Figure plastic model kit.